The educational programmes are free and aimed exclusively at schools from the Marche Region. The Educational Service is operational in the period October to May, on Tuesday to Friday, between 9:00 and 13:30. Aims: Familiarisation with the work of Duke Federico’s servants, and recognition of the areas where they provided these services, through the architectural features. Knowledge of plumbing structures and the importance of the water supply. The activities: After an introduction with the help of Power Point images, pupils are accompanied on a tour through the rooms and the most important points on the ground floor and in the basement. Starting with a look at the rooms and their details, this creates links between the customs of the past and the daily lives of servants and their lords. Workshop activities: At the end of the tour, the participants will be divided in groups to carry out an experiment on water purification, using recycled materials. TITLE:”Life in the time of the Romans”: typical day, jobs, activities and the entertainments of the Romans, reconstructed through the analysis of stone tablets. Aims: Knowledge of the uses and customs of Roman civilisation through the ancient stone tablets in the Stone Museum. In particular, the course will look at gravestones and try to reconstruct the daily life and customs of the Roman period. The activities: A Power Point presentation will be used to try to bring to life some of the depictions and inscriptions on the gravestones, projecting images of monuments, pictures, etc. that may make the perception of historical monuments more immediate. Aims: To consider Federico da Montefeltro’s palace as a wonderful occasion for hands-on experience of architectural themes, using it to interpret life during the Renaissance. The activities: After an introductory lesson on the Renaissance in Urbino and the development of the city’s structure, starting with its Roman core, students are then shown and can observe the different internal and external features of the palace. The focus is on the concepts of dimensions, light, proportions, materials, the angle of the floors, etc. Students will also consider the concepts of space and perspective by looking at Renaissance works. Workshop activities: different activities are available to be adapted to the course curricula of the different classes. Some workshops take place during the tour, while others are held in the classroom and require the completion of drawings in perspective or the insertion of figurative elements that have already been designed in the right spatial proportions inside perspective constructions. Some materials have been prepared to allow better understanding of humans’ visual ability in the relationship with surrounding space. Younger pupils can enjoy some of the puzzles with images of the works on display over the course of the visit. Aims: To discover the figure of the Renaissance Prince and Patron of the Arts through research into images and the portraits of Federico and his son Guidubaldo inside the Ducal Palace. Understanding the themes of the Renaissance. Description of the activities: Introductory lesson in the classroom with Power Point presentation. The tour continues like a treasure hunt, where each student is given a card with multiple choice or open questions and is sent to find and recognise the images of the dukes in the palace decorations or in the works on show. During the visit, information on Renaissance themes is reinforced. TITLE: “The Ideal Court: Urbino as narrated by Baldassarre Castiglione”: the period of the court of Guidubaldo and Elisabetta Gonzaga; the intellectuals and artists, the Renaissance works and the rooms in the palace in line with the ideal of the “perfect courtier”. Aims: A description of the 16th-century court, getting to know the personages who would have been at the court of Urbino, and the Renaissance values behind the arts, politics and works produced in this setting. Understanding of the fortune of “The Book of the Courtier” by Baldassarre Castiglione and the resonance it gave to the Montefeltro Court in Europe in the centuries that followed. The importance of a book that would become a point of reference for the creation of Europe’s new ruling classes, as it was happening in that period. 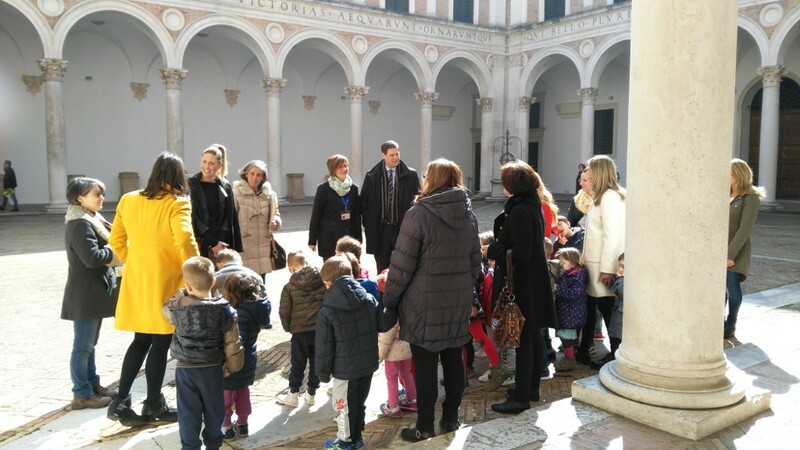 Description of the activities: after an introduction to the history with the help of Power Point images, pupils are accompanied on a tour through the rooms, and the most important points on the ground and noble floors inside the Ducal Palace. Starting by looking at the architecture and the different art works, the lesson will try to reconstruct the climate of the Renaissance Court of Urbino, as narrated by Castiglione, in the minds of the students. The tour will conclude, like the book, by looking at the same panorama that the palace’s inhabitants would have admired at the time. Workshop activities: in the Gathering Hall. Students will be involved in spoken word games inspired by Castiglione’s book. TITLE: “Wood inlay work”: The artistic technique and symbolic meaning. Aims: Getting to know wood inlays as an artistic technique used to decorate the doors and the study; knowing how to recognise the materials, processes and the creative development it enjoyed during the Renaissance. Interpreting the figurative appearance and the symbolic meaning of inlay work, what it tells us about the history and lifestyle of Duke Federico. The route of this tour is open to the public and therefore “official”, but it also helps to uncover an intimate, personal itinerary, which is that of the “Loca Sacra”, with the study, the hub for cultural and spiritual elevation around which the life of the court would gravitate. The activities: After an introductory lesson in the classroom, the students are taken through the interior of the palace to look at the study in order to find out more about the interests, values and ideals of Duke Federico as a political man, prince, condottiere and humanist lord. The art of intarsia or inlay work, especially as used in the architectural views, is a motive for reflection on the representation and three-dimensional nature of space and the study of perspective in the Renaissance. Workshop activities: students are invited to turn their hand to inlay work, using small tiles in different types of wood to create simple compositions. TITLE: “The Hanging Garden”: An invitation to visit a hanging treasure. Aims: To discover a reserved area dedicated to rest and contemplation. Knowledge of plants and flowers used in Renaissance gardens, for both medicinal and decorative purposes. Target: Kindergarten and Primary School. The activities: It starts with a classroom lesson with pictures of hanging gardens created through time. This is followed by a visit to the garden, looking at the plants, then a short visit to the Gallery to look at how the plants have been reproduced in the palace’s decorations. Workshop activities: The workshop will take place in the Hanging Garden, where children will be asked to place the images with pictures of the plants alongside the plants themselves in the different flower beds.